We are witnessing a transformation in the world economy as a result of the IT/e-business revolution. Modern logistics based on cheap communication and transportation are shifting the locus of production and the international division of labour between the West and the lower wage countries of East Asia and similar changes are occurring within East Asia itself. Looming over the entire picture is the colossus that is China and this transformation is making East Asia the manufacturing centre of the world economy. Written by a recognized expert in the area of business economics, this book analyzes these developments and evaluates their future impact on the development of East Asia and its role in the world economy. 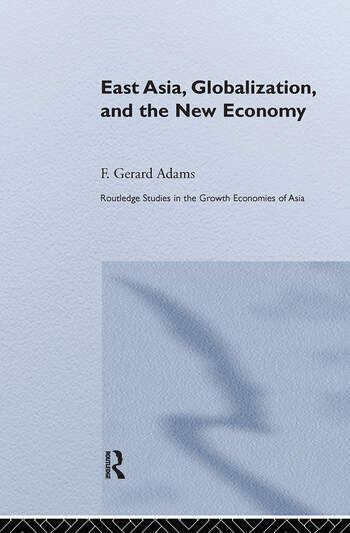 The book examines the effect of the IT revolution, globalization and the 'new economy' on the development of East Asia. The first book-length treatment of IT/e-business in the region, it questions whether the e-business revolution will renew and sustain the rapid economic development of East Asia. F. Gerard Adams is visiting Professor in the College of Business Administration at Northeastern University in Boston and Professor Emeritus at the University of Pennsylvannia.